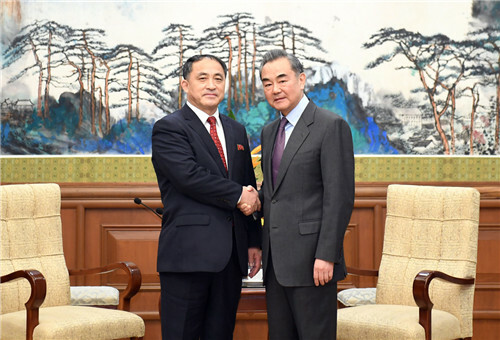 On February 28, 2019, State Councilor and Foreign Minister Wang Yi met in Beijing with Vice Foreign Minister Ri Kil Song of the Democratic People's Republic of Korea (DPRK). Wang Yi expressed that this year marks the 70th anniversary of the establishment of diplomatic relations between China and the DPRK. I welcome you to visit China to work with the Chinese Foreign Ministry on the planning and design for the commemoration of the 70th anniversary of the establishment of China-DPRK diplomatic relations. China and the DPRK should jointly well implement the important consensus reached by the top leaders of the two countries on developing China-DPRK relations in the new era, and take the 70th anniversary of the establishment of diplomatic relations as an opportunity to elevate China-DPRK friendly relations to new highs and open up new prospects. Ri Kil Song said that this year marks the 70th anniversary of the founding of the People's Republic of China and the 70th anniversary of the establishment of diplomatic relations between the DPRK and China. The DPRK side stands ready to, together with the Chinese side, take this important year as an opportunity to promote new development of bilateral relations in the new era. 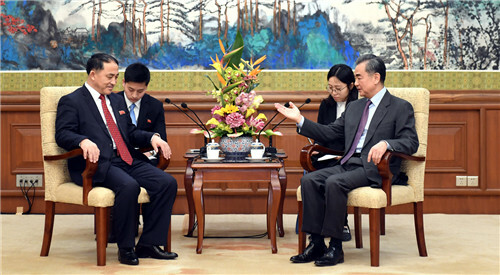 Wang Yi said that the international community paid close attention to the just-concluded summit between the DPRK and the United States (US) in Hanoi. Difficulties are unavoidable as DPRK-US negotiations have touched deep-seated issues. However, through dialogue, the general direction of the political settlement of the Korean Peninsula issue has been clarified, that is, to achieve the complete denuclearization of the Korean Peninsula, and to establish a peace mechanism on the Korean Peninsula at the same time. This was the important consensus reached by the leaders of the DPRK and the US at the Singapore summit, which conforms to the common aspirations of the international community including the DPRK and the US. As a Chinese saying goes, "Good things never come easy, but there is a lot to look forward to". It is hoped that both sides can consolidate the faith, remain patient, continue talks, meet each other halfway and make unremitting efforts for the settled goal. China is also willing to continue to play a constructive role in this regard.